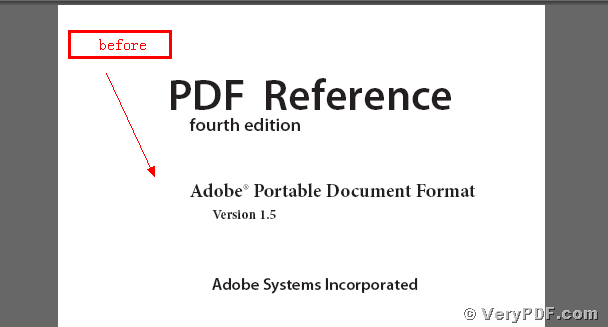 In my last chapter I talk about how to make pdf files opened in continuous view by using the Advanced PDF Tools,Today my topic is how to make pdf files opened in continuous-facing by using the Advanced PDF Tools.Maybe you will not difficult to find the difference between them.Make pdf files opened in continuous-facing it means that make the pdf files showed with double pages in the pdf window.Some office workers are prefer to reading the pdf files with double pages in the pdf window.Because it does not need to slide the mouse.It is very concise and simple to read.So if you need this function badly ,my advice is that pleas read this article carefully ,you can gradually master this function. 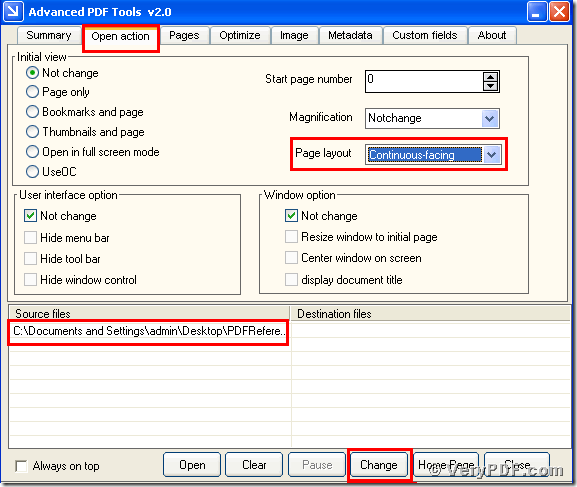 The first step,you need to double click the icon of the Advanced PDF Tools this software should better in desk in order to easily find it,if you have not ,please go to this website http://www.verypdf.com/order_pdftools_gui.html and download it ,a good new is that you can use the trial version,it is free.And then let this software run .When this software is opening, you need to drag your PDF file into this program.Later you will enter into the application interface.You can see the label pages like(Summary/Open actions/pages/Optimize/Image/Metadata/Custom fields/About),please click the label page”Open action” .You can see the option boxes like (start page number/Magnification/Page layout) .You need to find “Page layout ”,the matched option box default property is “Not change” ,but you need to choose the “Continuous-facing” .Because this action can make pdf files opened in continuous view. It can let this function come true. Then save the change.Please look at picture 1. The second step,you ought to open the changed pdf file, then you will find the change,we had made pdf files opened in continuous-facing by using the Advanced PDF Tools.I also give you screenshots (picture 2 and picture 3) and compare to them, the difference is so clearly.Here please look at picture 2 and picture 3,it is very obvious. 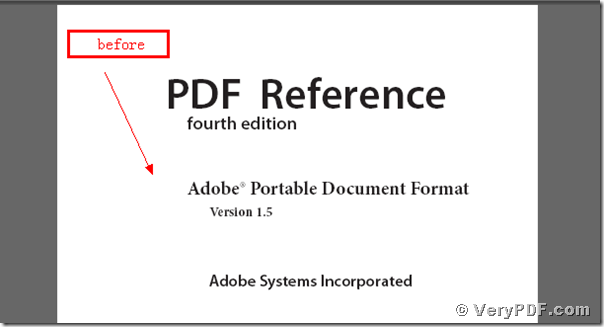 When you compare to them ,after the change you will find that the pdf files opened in single continuous-facing. 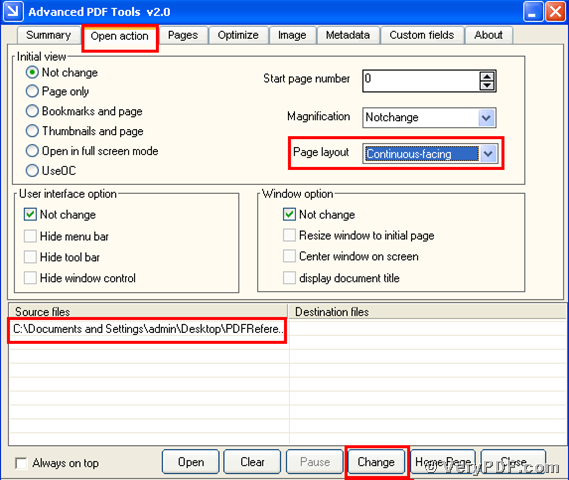 You see it is very easy to operate it,according to the picture 2 and picture 3,you can easily find the effect of the Advanced PDF Tools,if you want to know more about how to make pdf files opened in continuous-facing ,you can refer to this website or visit http://www.verypdf.com/wordpress/ and read more articles.Meanwhile if you think that the Advanced PDF Tools is useful and remember go to this website http://www.verypdf.com/order_pdftools_gui.html and purchase it.